Cordless Handheld 1D and 2D Barcode Scanner mobile handheld all-purpose barcode scanner Zebra DS2278 reads 1D and 2D barcodes in a matter of seconds - from classic paper and plastic labels to smartphone displays. It captures customer cards, promotion cards, vouchers and much more for simple payment settlement, also directly from a customer's smartphone – optimal for usage in retail and hospitality, even during peak times. 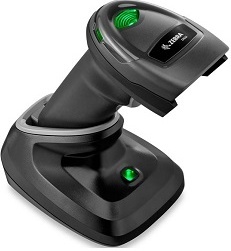 Thanks to Bluetooth 4.0 and Zebra's Scan-To-Connect technology the area imager connects with any Bluetooth-capable computer, smartphone or tablet in a single step, and provides a reliable connection up to a range of 10 m. Zebra's Wi-Fi-friendly mode prevents interferences between the scanner and the WLAN connection for both employees and customers. The multi-functional area imager is ready to go when it leaves the factory, as a result of comprehensive pre-configurations – just unpack it and get started! Thanks to Zebra's free-of-charge remote software SMS (Scanner Management Service), you manage and configure the DS2278 and many other models worldwide from a PC, smartphone or tablet. The integrated 2400 mAh lithium-ion battery offers a guaranteed operational performance of 14 hours on a single charge.